Do you play soccer? If not, it’s time you joined those playing in the field close to your house. You may not score a goal, but you are sure to score on fitness level and avoid lifestyle-related diseases. An extensive soccer research project involving more than 50 researchers from seven countries studied the physiological, psychological and sociological aspects of recreational soccer. Led by Peter Krustrup and Jens Bangsbo, both sports science professors from the University of Copenhagen, the three-year project covered several intervention studies involving men, women and children (aged between 9-77). They were divided into soccer, running and control groups. The conclusion was clear. Soccer provides broad-spectrum health and fitness effects that are at least as pronounced as for running, but in some cases even better. Study leader Krustrup said: "Soccer is a very popular team sport that contains positive motivational and social factors that may facilitate compliance and contribute to the maintenance of a physically active lifestyle." "Soccer training for two-three hours per week causes significant cardiovascular, metabolic and musculoskeletal adaptations, independent of gender, age or lack of experience with soccer," he added, according to a Copenhagen release. According to Bangsbo, the effects can be maintained for a long period even with a reduced frequency of training to one to two times one hour a week. 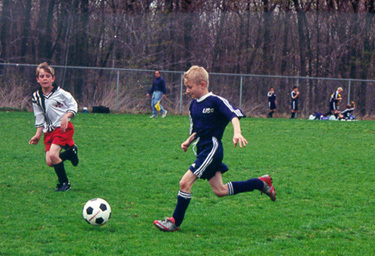 The two researchers foresee a great perspective in using soccer as a health promoting activity: "Future studies are needed to understand what is causing the beneficial effects of soccer, how well soccer can be used to improve heart health in early childhood and how other patient groups such as those with type II diabetes or cancer can benefit from playing soccer." The results were published in a special edition of the Scandinavian Journal of Medicine and Science in Sports .